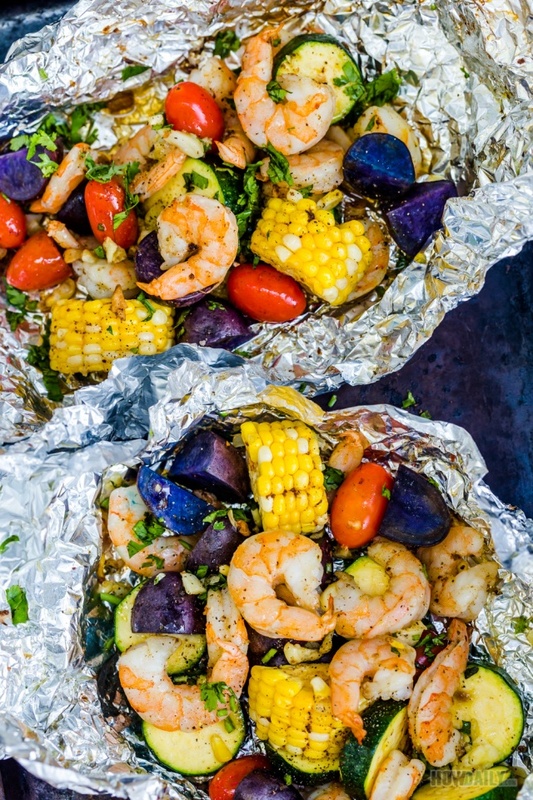 Quick entree to prepare, these shrimp foil packets pack a whole bunch of flavor. With shrimp, potatoes, tomatoes, zucchini and corn, all those natural juice just about to come out. Seasoning with old bay, ground pepper and a bit of lime juice is enough. If you want more flavor, add honey or same more salt. Browning some extra butter-garlic with fresh chopped parsley for drizzling all over after the shrimps are finished will up the scent a knot. Or you could use it as dipping sauce as well. Corn - husked and cut into four and then half lengthwise. Potatoes - wash and cut into quarters or thinner slices. Shrimp - peel and deveined. In a small sauce pan melt 4 Tbsp butter, then add minced garlic to brown a little bit. Transfer brown garlic-melt butter to a large bowl or container, then add Old bay seasoning and lime juice. Add shrimp, corn, potatoes, tomatoes, thick slice zucchini and stir well to mix/coat with seasoning layer. Let sit for 10 minutes to soak in. Start the grill or pre-heat oven to 400F. 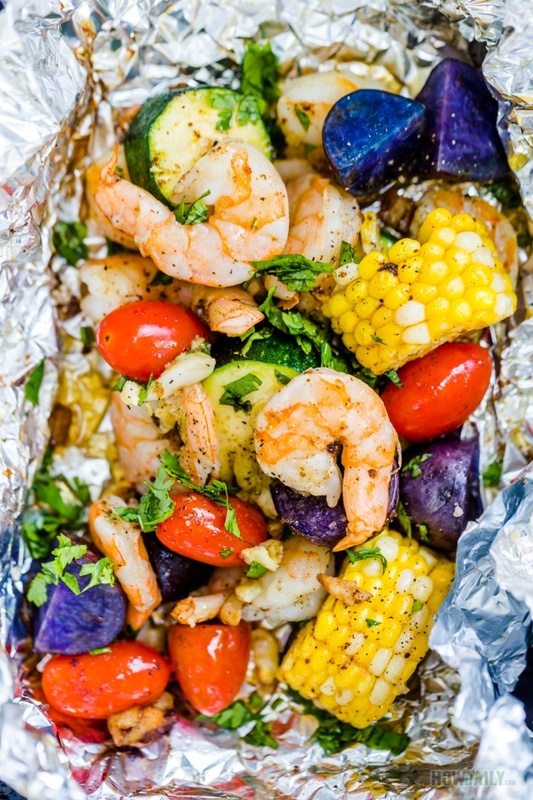 Divide ingredients into 4 aluminum foil sheets, fold and crease to form closed packets. Toss onto grill (medium heat for 8 minutes) or oven (400 F for 15-20 minutes). 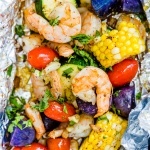 Flip the foil packets and cook for another 5-10 minutes or desired tender. While grilling, melt 3 Tbsp butter in a small sauce pan, add some minced garlic to brown. Add 1/2 of chopped parsley and a sprinkle or two of salt & pepper to the hot butter. Stir to mix and remove from heat. 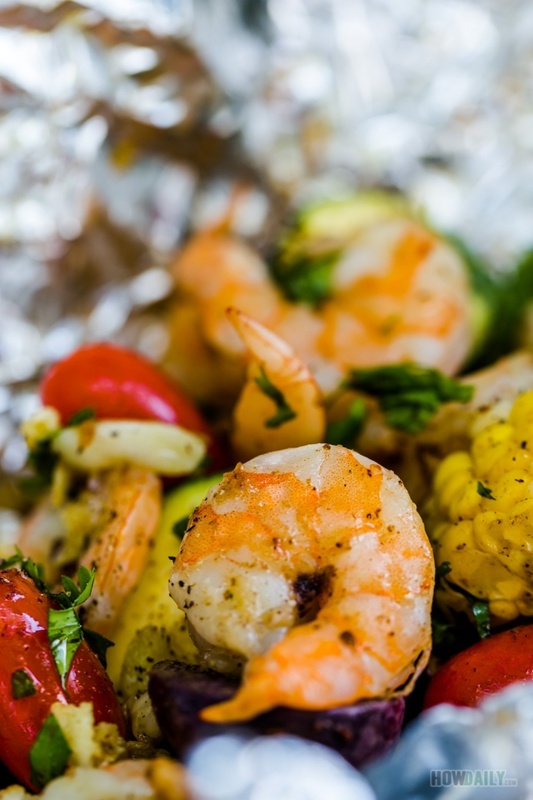 Once the shrimp foil packets are done, open them and sprinkle remaining chopped parsley and some ground pepper.